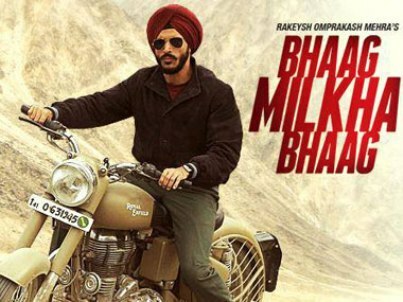 Farhan Akhtar and Sonam Kapoor starrer ‘Bhaag Milkha Bhaag’ (BMB) has become the latest movie to join the Rs. 100-crore club. The biopic tells the story of the Flying Sikh, Milkha Singh. After the release of BMB, other movies which were released around it could not make a mark at the box office. In 2013, ‘Bhaag Milkha Bhaag’ has become the second movie to cross the Rs. 100-crore mark. Meanwhile, other movies which were released in the last three weeks, like ‘Bajate Raho’, ‘Issaq’, ‘Nasha’ and ‘Love Your Soniyo’ could not achieve the same success at the box office. The movie is directed by Rakeysh Omprakash Mehra, who managed to capture the life story of the Indian athlete. ‘Bhaag Milkha Bhaag’ was last week declared tax free in the states of Maharashtra, Delhi, Madhya Pradesh, Haryana and Goa and this will help the movie to continue doing well at the box office. Even the movie ‘Yeh Jawani Hai Deewani’ – which stars Ranbir Kapoor – also made it to the Rs. 100-crore figure and was released in June 2013. When the biopic was released, it received plenty of positive response and since then, it has been the choice of movie goers all around the country.